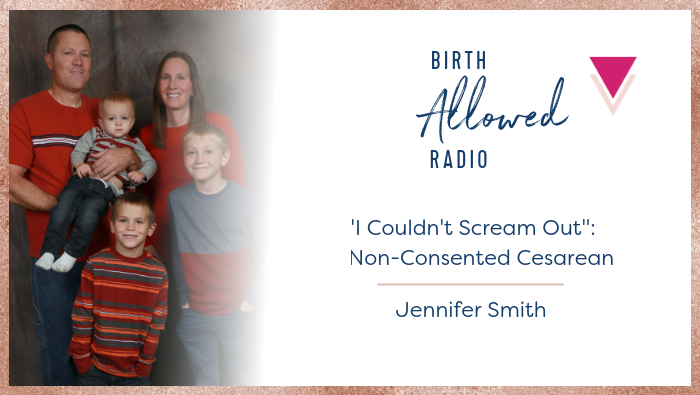 In this emotional episode, New Mexico mom Jennifer Smith describes having a Cesarean without consent after medical staff ignored her decision to have a vaginal birth rather than repeat surgery, and her trauma afterwards. “I’m numb from the waist down and I have no idea what they’re doing to my lower body. I’m just this object lying on a table for them to cut up. And they don’t care. And I can’t scream out. Because I don’t think anybody’s going to listen to me. And I’m scared… I’m trying to stay awake. And I remember as this doctor’s cutting me up, Dr. R, he’s having a personal conversation with Dr. P about the Olympic male gymnast who broke his tibia. And I’m sitting there thinking, I’m not even here. Like I’m not even here. It doesn’t even matter.